Commercial / Whole House Reverse Osmosis System that produces 7000 gallons per day. 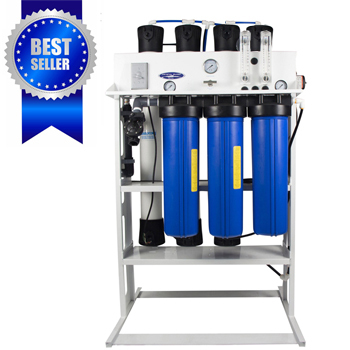 Thunder series Commercial RO System is built on a technology that's putting water through a semipermeable membrane(s) to remove majority of particles from the water. The membranes remove TDS (total dissolved solids) and many other contaminants at the average rate of 95%, leaving only very pure H2O molecules. The contaminated stream gets rejected and is typically discarded. 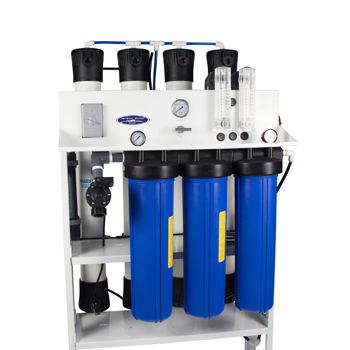 With Four large, 4"x40" commercial size membranes and a 1.5 hp motor, this unit is capable of producing up to 7000 gpd of purified water (at 77 F water temperature). Easy Maintenance & Operation: feature a compact design and have all of their components strategically located for easy access and inspection. Membranes: Four 4" x 40" , 4040 TFC Membranes, for maximum rejection of impurities and high flow. Membrane Housing: Four 4" x 40" Champ membrane housings, Features a patented design and requires no tools for servicing. Pump: One 1.5 HP Multistage Pump and Motor, 110 or 220 Volts AC, 60 or 50 hertz. Frame: Aluminum, White Powder Coated, Corrosion resistant, and light weight. 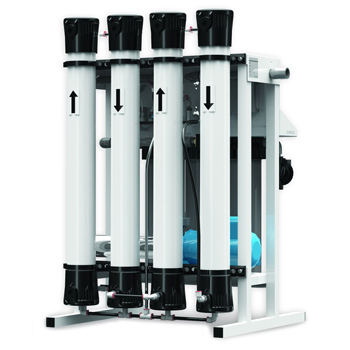 Sediment Filter: One 4.5" x 20" Big White 5 micron sediment filter, Removes sediments and protects the system. Carbon Block: Two 4.5" x 20" Big White 5 micron carbon block, Removes chlorine, odor, and taste from incoming feed water. 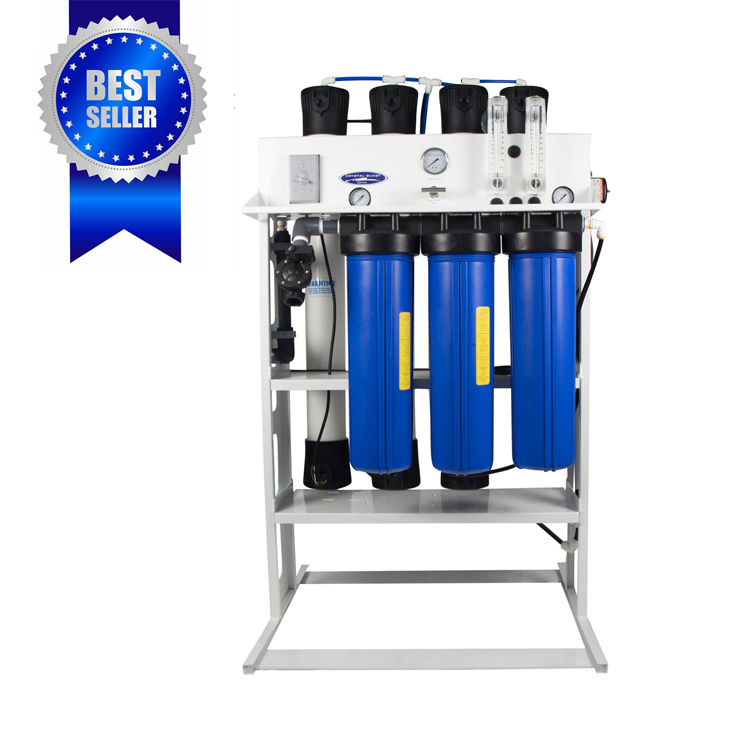 Filter Housing: Three 4.5" x 20" Big Blue double O-ring filter housings, Offers durability and improved sealing capabilities. Pressure Gauges: Two 2.5" Gauges, 0-300 PSI, Panel Mounted Glycerin filled, and Two 1.5" Gauge, 0-160 PSI, top mount dry gauges, For monitoring the system's operating pressure, the filter and carbon operating pressure. Low Pressure Switch: One McCann's Low Pressure Switch, Safety device to protect the pump from running dry when there is insufficient feed water pressure. Solenoid Valve: One Solenoid Valve with manual override, 110 or 220 Volts AC, 60 or 50 hertz, Assists with the on/off functionality of the system. Manual Flush Valve: One 1/2" brass needle valve, Regulates the product to waste ratio (systems recovery). Switch: One manual on/off Switch. Concentrate Re-Circulate: This feature offers a higher recovery rate for the system by taking a percentage of the waste water and feeding it back into the system. High Pressure Switch: One Square D high pressure switch, Automatically starts when the tank pressure falls below 40 psi, and stops when the pressure reaches 60 psi. Flow Meters: One Product (0-2 GPM) & one waste (0-5 GPM) flow meters, enables operator to accurately adjust product to waste ratio and monitor systems performance. Stainless Steel Housings: Four 4” x 40” PuroTech stainless steel membrane housings, 1/2” FNPT. Computer Controller: One Computer Controller, 110 or 220 volts AC, with pretreat lockout, tank full contacts, low pressure monitoring, and alarm. High Flow Sediment Filter Cartridge 20"